Email marketing is more popular than ever. However, 2.4 million email sent globally every second are making marketer’s job a lot harder. It’s important to learn new strategies of email marketing and lead nurturing that converts leads into customers. We are excited to announce a cool strategy – Video (Visual marketing) integration in email campaigns. Did You Hear About Visual Marketing! Choose the right type of content. Visuals have the power to attract people who wouldn’t take the time to read long copy. Using tags with your visual content provides an excellent opportunity to be found through organic search. It helps to get large number of audience through social media. Here are some FACTS which reveals that visual marketing is very effective to increase traffic, social media presence, lead generation and customer acquisition. 90% of information transmitted to the brain is visual. Visuals are processed 60,000x faster in the brain than text. High quality infographics are read 30x more than text only blog post. Photos are liked 2x more than text updates on Facebook. Tweets with images receive 18% more clicks, 89% more favorites and 150% more re-tweets. Images and photos are the most important tactic in optimizing social media posts. 93% of most engaging posts on Facebook include images as opposed to status updates, links etc. 70% of marketers plan to increase their use of original visual assets in 2015. 40% of people respond better to visual information than plain text. 94% more page visits are received by social posts with images than those without. 60% of consumers are more likely to click on a business whose images appear in search results. 12% average growth in traffic for businesses who market with infographics. 40% of people will respond better to visual info than plain text. People love watching videos. Videos are an easy and entertaining medium to deliver more information. Video has become an essential marketing tool. 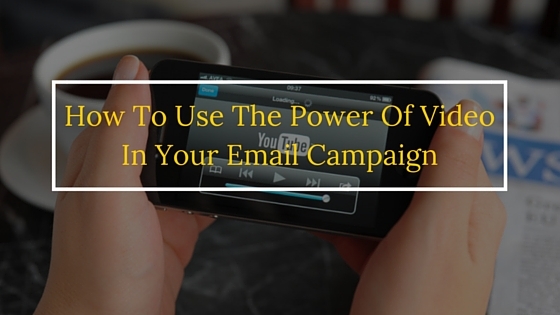 It’s very effective to use video in your email campaign. 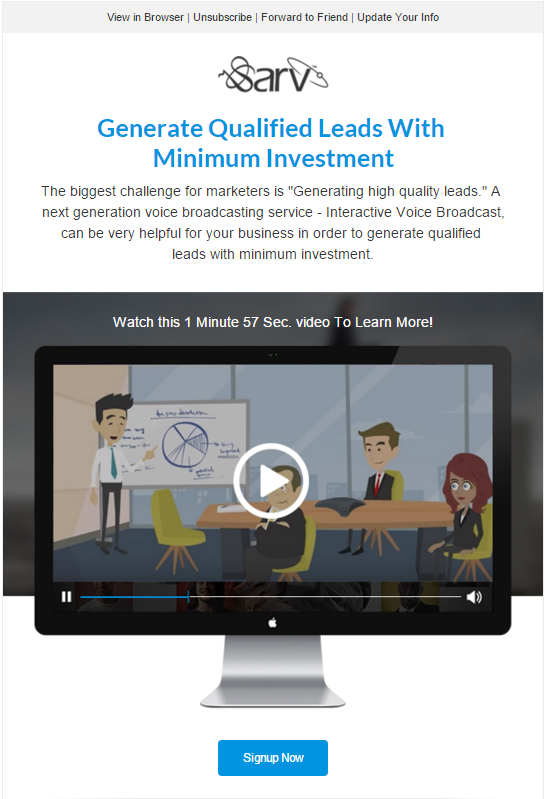 It will boost your leads, conversions, sales and keep your customers happy & engaged. Video in Email Campaigns can increase Click-Through Rates by 65% and ROI by 20%. Marketers who integrate video in email generate 40% higher monthly revenues than those who don’t use. 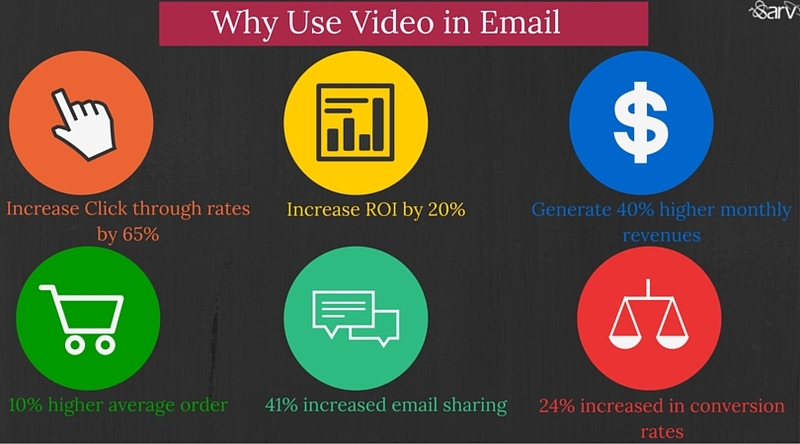 Marketers who use video in email have a 10% higher average order. 81% of marketers planning to use video in future email campaigns. 24% increased in conversion rates. How to Use Video in Email? 1. Video plays inside the email. 23% of marketers embed video player in email message. 27% of marketers use animated GIFs in email. 3. Using a static image with link to a page. 29% of smart marketers link to a video landing page. 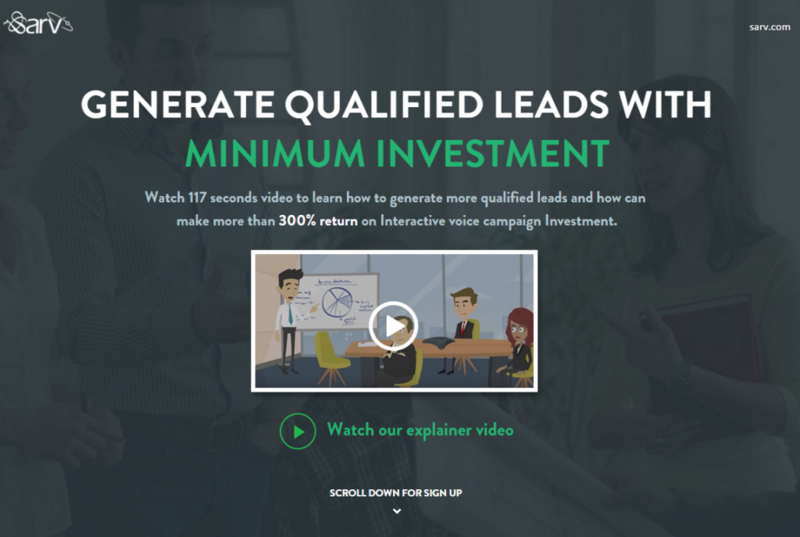 We recommend you to use a static image or GIF with link to a video landing page. Tip 1: Make a short length video relevant to your product or services. Take your time to create an interesting video. Tip 3: Highlight value of video in email copy and use it as the primary visual element in your message. Tip 4: You can also use GIFs instead of static image. Tip 5: Place strong calls-to-action (CTA), such as “Watch Video Now” and link it to a landing page. Tip 6: Using the word “Video” in an email subject line boost open rate by 19%. Tip 7: Embed video to your dedicated landing page. Tip 9: Encourage video sharing. Be a smart marketer and use the power of video and email together for best results. You can also check out some bestsellers video types which can help you to create a right video here – How Videos Help Your Business : 12 Top Ideas.